Whether you are already a parent or an expecting one, a jogging stroller is a necessity for you if you are into fitness. 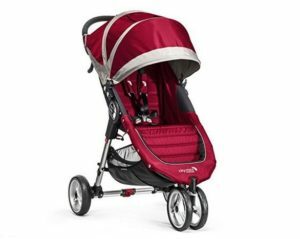 That is why I delved into reading the latest Baby Jogger Stroller Reviews to find out if these are the best strollers for running. When you go outside, keeping your baby or toddler in your arms the entire time could get quite tiring. At such times, a baby buggy is a lifesaver, allowing you to carry your child with you to any place. However, there are several types of jogging strollers, each having many features that fit according to the needs of different children. 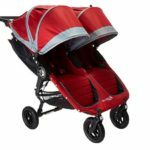 From the top jogger stroller brands, the Baby Joggers have managed to gather a horde of loyal customers. Therefore, a few of their prams have been described in the stroller review below, aiming to help shoppers make the right choice. 5.4 Where To Buy It? A single pram which could be used for all terrains, the City Classic Single Stroller is going to wow you with the way it runs so smoothly. This product’s 3 large size 12” wheels provide it with stability. A cool shade of red, it will be loved by both parents and children. Gifted with a storage bag just below the seat, this unit also comes with a cover of the right size. This canopy does well to shield your child from the harshness of the weather. Moreover, the seat of this pram is removable, permitting the user to wash it whenever it gets too filthy. All in all, an excellent choice for all parents. A pushchair for two that does an impeccable job, the CityMini GT is fit for all terrains. Its 4 8” wheels allow the user to maneuver it around, around sharp curves and turns, with ease. This product is easily foldable if needed to be transferred from one location to another. Furthermore, the handlebars are bendable, right for people of all heights. Brilliant black, this pram has been adorned with a great sunshade, keeping your children safe from the glare of the sun, also providing the perfect ambiance for a nap. This is why, if you are looking for an awesome pram, this is definitely it. Black and sharp-looking, this push chair is excellent for almost any parent and child duo. Along with 4 medium sized 8” wheels (with double front wheels compatible with different terrains, but more suited for the urban conditions) that assist in easy steering, this product also comes with an oversized canopy. A double seater, the Mini Double Baby Jogger is just right if you have twins or two young children. The seats are well-padded, proving to be comfortable for the kids, even for long walks. The storage basket underneath is thoughtful, holding necessary items for the user. Moreover, this is lightweight stroller, making it uncomplicated to carry from place to place. As a result, this product ticks all the necessary features. This stroller’s 3 medium size 8” wheels deliver exceptional comfort, making this product a favorite among several customers. The seats of this unit are thickly padded, promising a secure seating for the child. The Baby Jogger City Mini is a pushchair for all types of terrains, but more suited to the urban landscape. Also, this is also ultralight jogging stroller, enabling customers to grab it and go out now and then, as per the errands they need to run. Weight capacity is about 50 pounds, which adds to the perfection of the perambulator. Also, the black color appeals to both girls and boys. In conclusion, this baby buggy is excellent for almost anyone. 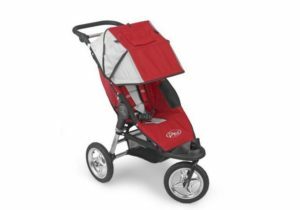 I will start my Baby Jogger Stroller review with this great stroller. Keeping watch over your child is said to be a good exercise. Yes, it may be an exercise, but you can also prevent the frustrations of having the wrong equipment that makes your daily activities with your child quite a hassle. If so, you better get this Baby Jogger City Classic Single Stroller 2018. If you live in an urban area, you must be one of the people who love to jog and stroll on the park with your child in his pushchair. These moments can be quite an experience for the child to discover and explore the world. However, if his jogging stroller is not easy to maneuver you might be having quite a difficult time during your outdoor trips. With this single jogging pushchair, you get a maneuverable pram for your benefit and comfortable padded seats for your children. It has all the amenities you need such as a storage basket and sun canopy to give your child an enjoyable ride. Also, the seats are removable so you can wash it thoroughly. You can ensure the comfort and happiness of your baby if you strap him in this pushchair. There is a five-point harness to keep your kid in place without inhibiting freedom of movement. The shoulder pads and buckle cover are padded as well, so he gets no sores from being strapped in. The sun canopy has multiple positions so that you can adjust it accordingly. If he needs to take a nap, the seat reclines up to about 150 degrees near-flat angle. The reclining seat is vented for better ventilation while your kid is taking his rest in the perambulator. You will have your kid’s things easily accessible if you place them in the storage compartment at the back of the seat. The storage of this stroller is simple because of the Patented Quick-Fold technology. You can quickly put it in the trunk of your car without straining since it weighs only 16.8 pounds. The 8” wheels have ball bearings so you can quickly turn corners and tight curves. The tires are indeed capable of handling changing terrain so you can take your kid anywhere you want in this carriage. This type of baby carriage makes your life easier. The City Classic pushchair is the epitome of the perfect baby cart. Compared to the typical Bob, Phil and Ted’s prams, this is a much better product in all aspects of usefulness. This model has adjustable handlebars, is easily cleanable (hence has better hygiene control), has flat recline seats for the baby’s comfort and more straightforward controls; noteworthy features which make it the cream of the crop in the world of strollers. The shade that covers the upper portion of the structure deserves special mention here due to providing excellent shade to the baby, as the bright summer sunshine could otherwise harm the baby’s delicate eyes. The City Classic Single push-chair has been so well received by the general public that negative comments regarding it are practically non-existent. But if a flaw has to be pointed out, it has to be non-uniform wheel rims, which gives a somewhat weird look to the overall impressive design. The performance of the carriage is unchanged by this minor error, so that isn’t much to worry about. Reviewers deem the City Classic pram to be one of a kind, all around pushchair that is sure to satisfy any buyer. Living downtown can be quite unfriendly for your child if you don’t have the proper equipment that makes life more comfortable and convenient. If you are living in an urban area, you must know the difficulty of taking your baby outdoors. If you are fond of taking your kids for a stroll in the park or a quick trip to the store, you should get yourself one of these double pushchairs that can give them comfort while you easily maneuver the carrier around the busy streets or aisles. Going outside is gonna be a whole lot easier with Baby Jogger City Mini GT Double Stroller. It has all the amenities you need for your kids’ protection and comfort. You can now take them out without having to worry about your baby carrier. It is time for you to switch to this Baby Jogger stroller and have a stress-free outdoor stroll in the streets. This pram is one of the lightest strollers on the market that provides you with ease when it comes to steering and folding. 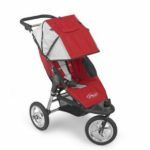 You don’t have to get stuck around corners and aisles anymore with this lightweight urban jogging stroller. 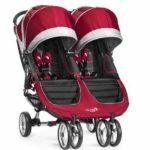 The City Mini GT pram for twins comes with a variety of colors that eases into your child’s sense of sight and familiarizes the little one to the hues of this world. From crimson to blue to gray, the outlook of this baby carriage can be adjusted to quite a fashionable one. In terms of ease of usage and general application, this jogging stroller beats the others in the market due to having all terrain functionality, thanks to its advanced wheel mechanics. Even in a bumpy road of a hilly area, the Mini GT Double perambulator works like a charm. It is made of sturdy materials that will always keep the child inside it safe from harm. Vented seats allow steady airflow inside the structure, which means that the child will never face breathing difficulties nor will he feel confined. To improve safety measures, the pushchair comes with an auto lock feature which lets the device stay closed whenever it is folded, with the lock being removable if need be. Because the seat stays flat, the entire pram can be used individually without the need of attaching it to a car seat. This eliminates a lot of hassle involved in using the baby buggy at random moments. The double sides of the City Mini GT carriage help when there is more than one child to be raised. The siblings can share the same environment, without having to compete for a spot, as both the sides are made equally. The height of the canopy and the breadth of the two compartments are perfect for quickly growing children, especially those taller than their age. If you are a first-time parent, then this twin push-chair is just the one for you. There are simply no other strollers which have been designed to be used so effectively, even by new mothers and father. If you are about to go jogging and you need to take the kids with you since your husband is away, Baby Jogger City Mini Double Stroller will help you manage your kids quite efficiently. Having two kids is difficult if you do not have the patience and practicality all parents should have. If you are always faced with problems on how you should look after your two children, a good baby buggy might just be the answer to your questions. Strolling around the busy streets can be difficult especially if you have the wrong jogger. Some prams are hard to maneuver in those crowded sidewalks because of their size and unfriendly wheels. So, make sure you get the most out of your money by getting a comfortable pushchair from Baby Jogger to keep your children in. Aside from the features that make it easy for the handler to have this stroller, it also provides comfort and safety for the kids that are seated inside. The seats are padded to give them a comfy ride despite the terrain and swerves you’ll be taking them in. If they need to on a nap, the seat reclines to near flat so that they can lay back. This is a lightweight but sturdy twin perambulator that offers features for your kid’s comfort and safety. Patented Quick-Fold Technology – it only weighs 23 pounds and has the patented Quick-Fold technology of Baby Joggers, so you don’t have to fuss over it when you need to put it in your trunk after a day’s ride. Wheels – the wheels are large enough for a smooth turn of 180 degrees but not too large to hinder you when it’s folded. Storage Area for your belongings – if you need to get to your things when you are out with the kids, there is a large storage area under the seats. You can put it in their toys and changes of clothes there. Secure Harness System – the harness system is comfortable and safe. The seats are fixed so your children can mind their own business in their respective positions to stop bothering each other and make them behave. This is a double carriage that will help you in keeping your children safe and comfortable. 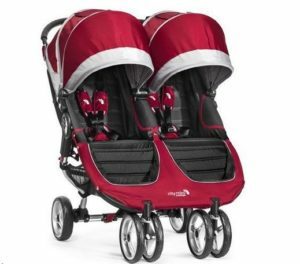 Multiple stores have various color options of City series Mini Double strollers in stock – try Amazon and Walmart. Any experienced parent fitness enthusiast will vouch for the fact that City Mini Double Stroller from Baby Jogger is an ideal baby carriage. This new version comes with added features such as more manageable weight, easy fitting through confined spaces, advanced movement system, and overall, better amiability for new parents. Despite the delicate looking structure, the City Mini Twin carriage has a tough exterior and does not wear down after repeated usage. The only notable problem is the handlebar, which has been said not to be adjustable, hence causing holding problems for those who cannot reach the cart at easy arm’s length. There are accessories you can purchase for an added price to keep your kids more comfortable. The safety bar will help you secure your kids inside the baby buggy, and you don’t have to strap them in each time. There are rain canopies that you can purchase to keep your kids from getting wet during an unexpected rain shower. With Baby Jogger City Mini Single Stroller going out for a quick trip to the store or a stroll in the park is not a hassle anymore. When you need to go someplace with your toddler in tow, you will not find it complicated anymore. The busy streets won’t be a difficulty and the store aisles no longer a big challenge when you bought this stroller for your kid. You will have no trouble maneuvering this push-chair because of the 8” wheels with front suspension and ball bearings. These features make it a breeze to turn along corners and curves. So, if you have to meet with your friends and no one will watch over the kid while you are out, take the pram with you, and you’ll have an easy time outdoors. While you are outside and the rain unexpectedly began to pour, the City Mini carriage has a 3-panel bubble canopy to protect your child while you make your way back to your car. 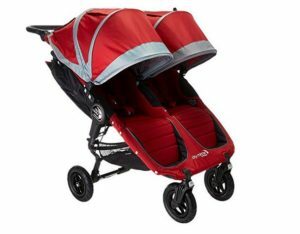 The canopy has two peek-a-boo windows so you can still keep watch while you are pushing the pram. Aside from that, it is equipped with a Patented Quick-Fold system. That, coupled with the lightweight frame of the stroller will make it easier for you to fold it and put it in the trunk without straining. The seat is padded for comfort and reclines so that your child can take a nap in his baby carriage. The five-point harness is for security and also allows freedom of movement. There are shoulder pads in the harness to keep from making your baby uncomfortable while strapped in the perambulator. The buckle cover is padded as well. All these are for the comfort and safety of your kid. This jogging stroller is the kind of product that will attract anyone at first sight. It looks appealing, has a smooth and sleek design, and seems to be the most comfortable thing an infant could ever enjoy. The seat can support grown babies, and the leg resting areas are built to cause no surface tension against the toddler’s feet. This model is also exceptionally light, which means it can be carried around without any hassle; a feature which acts as a double-edged sword in this case. The lightweight structure causes the pushchair to fall over quickly, a feature which has been claimed to cause specific balancing issues. Still, the City Mini carriage has been praised time and time again to satisfy countless customers and garner tremendous compliments and positive feedbacks, a fact which solidifies its claim to be one of the best baby carts of all time. There indeed are several accessories you can buy along the pushchair. It can take a belly guard or a food tray. Also, there is a storage basket under the seat so you can put in your diaper bag and other baby stuff. If you wish to make your outdoor trips with your little one a great bonding moment, get a good baby buggy and enjoy the outdoors with your kid. Amazon has 5 color options of City Mini pushchair in stock. Since the dawn of time, raising a child has been considered to be a very sensitive task that requires the utmost dedication. Nowadays, there are a lot of beautiful products for toddlers that help us to raise the young ones better and more effectively. One example of such would be jogging strollers. While not something vitally essential for human life, an exceptional baby buggy is definitely one of the most helpful items a baby can rely on for improved development. 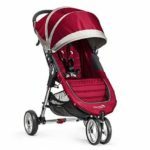 The company Baby Jogger brand brings forward the new Baby Jogger City Elite Single Stroller to establish the amazingness of prams, and it was a feat well accomplished. Attached with the quick fold mechanism, just a single hand is enough to fold the entire structure of this pram. Brakes, which are situated in rear drums, can be easily pulled using the hands, and the kicker is raised at a comfortable platform. The seat is padded and can recline fully, all the while having enough space for even larger babies to enjoyably spend their time inside. Having a mass of 26 pounds, the City Elite pram is a lightweight item that is also quite sturdy for its size. It has a maximum weight capacity of 75 pounds, which again, is impressive considering its height and weight. It will secure the perfect safety for your newborn and will keep it away from harm at all times. What sets the Elite Single Stroller apart from any other like it, is that it does not follow the concept of the typical four-wheel prams. As crazy as it sounds, this jogger has three wheels, with the lone one being on the front that can be locked or unlocked at will. Contrary to our expectations, this does not affect the stroller’s weight balance at all. In fact, it makes it better. The non-flat tires allow the carriage to correctly stride across bumpy surfaces, and it faces little resistance going over gravel, rocky pavements or slippery surfaces. This feature complements well with the rubber handle which gives easy maneuvering options and excellent grip. The bar of the handle is even adjustable at different heights. The Elite pushchair is without a doubt a pushchair that has no problem stopping, turning or being driven at a moment’s notice. Along with a vented seat top, this baby buggy also comes with a sun canopy. A vital part in any baby carts, a canopy is needed to ward off excessive sunlight and to provide cooling shade for the infant. The sun canopy of the pram has little windows for the child’s delight, and it contains ventilation panels on the sides. The air flow inside the stroller is maintained excellently, ensuring that the child will never face problem regarding breathing issues. As for storage, there is a compartment in the backside of the jogger to keep feeders and toys, and a basket is also presented under the seat for additional depository support. Shoulder pads on the device consist of five-point safety harnesses that will eliminate any chances of an unlucky accident. The Elite stroller is the perfect combination of all the features that any parents could ever want in a great jogging pushchair. Backed up by the trust of a well-known company, this product aspires to satisfy the customer with all these top-class qualities; it is hard not to choose this pushchair as the go-to jogging perambulator.